If you’ve bought a new iPhone and want to sell your old one you’ll need to transfer your data to your new device first before selling the old one. This guide shows you how. If you have an iCloud account that is by far the easiest and best way to transfer your data. To use iCloud see this article: How to Transfer Your Data from Your iPhone Using iCloud. 1. Firstly, it is important to make sure that your iOS and iTunes account are running the latest versions. If they aren’t please download the latest version of iTunes from Apple. You then need to select the backup option in iTunes, and transfer your data from your device to your computer option. 2. Next, you will need to turn on your new iPhone and complete the setup assistant (selecting your language, country and location services). Make sure you chose Wi-Fi network at this stage. If you don’t have Wi-Fi, not to worry as you can “Connect to iTunes” and use this option instead. 3. When asked to set up your iPhone, select “Restore from iTunes Backup” option. 4. You will then need to connect your new iPhone to iTunes (on the same computer you used to back up your current iPhone). iTunes will then ask you to restore from backup or set up as new. 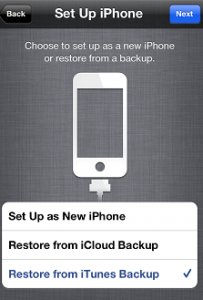 Here you can select the backup that you made in the first step, and then continue to restore this backup to your new iPhone. The time this will take, will depend on how much data that you have stored in the backup. 5. The final step will just be the phone restarting after the full restore, and the syncing with iTunes. Music, videos, and apps won’t be backed up so connecting your new iPhone to iTunes will make sure that all these are synced and saved.